Before he had turned 21, Arthur Rimbaud (1854–1891) upended the house of French poetry and left it in shambles. What makes Rimbaud’s poetry important, argues Seth Whidden, is part of what makes his life so compelling: rebellion, audacity, creativity and exploration. Almost all of Rimbaud’s poems were written between the ages of fifteen and twenty. Against the backdrop of the crumbling Second Empire and the tumultuous Paris Commune, the poet took centuries-old traditions of French versification and picked them apart with an unmatched knowledge of how they fitted together. Combining sensuality with pastoral, parody, political satire, fable, eroticism and mystery, Rimbaud’s works range from traditional verse forms to prose-poetry and the two first free-verse poems written in French. 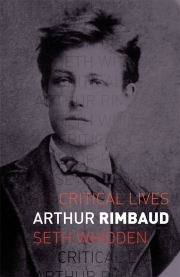 By situating Rimbaud’s writing in Africa as part of a continuum that spans his entire life, this book offers a corrective to the traditional split between his life as a poet and his life afterwards. Written for general readers and students of literature alike, Arthur Rimbaud presents the original damned poet who continues to captivate readers, artists and writers all over the world. Seth Whidden is Professor of French at the University of Oxford and editor of Nineteenth-century French Studies. His publications include Leaving Parnassus: The Lyric Subject in Verlaine and Rimbaud (2007) and Authority in Crisis in French Literature, 1850–1880 (2014). For ten years he served as co-editor of Parade sauvage, the scholarly journal of Rimbaud studies.